Friday morning I talked M&D into having their driver-for-the-day drop me off at the bus station on their way to visit a mountain & waterfalls a few hours away. 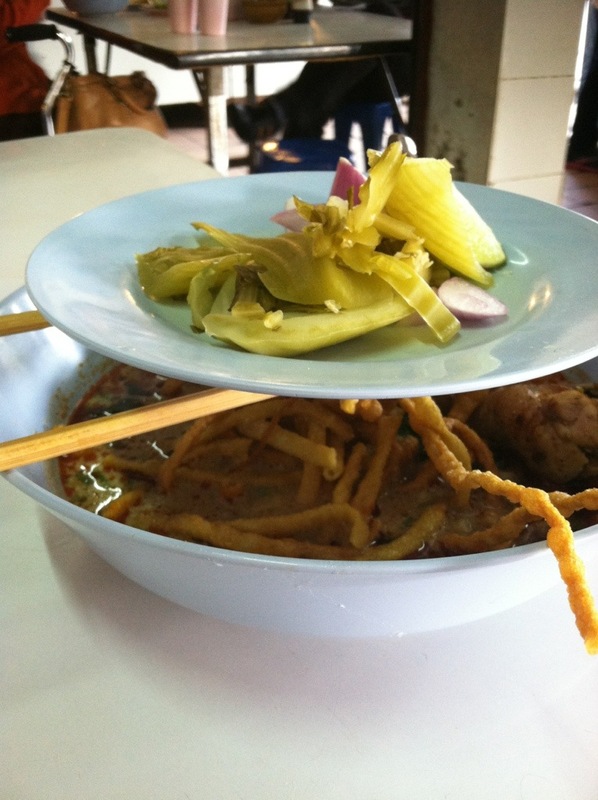 Even though I had already had breakfast at the hotel, and even though it wasn’t quite 10am, the smell of khao soi from a vendor at the bus station was too much to resist. I love that stuff! 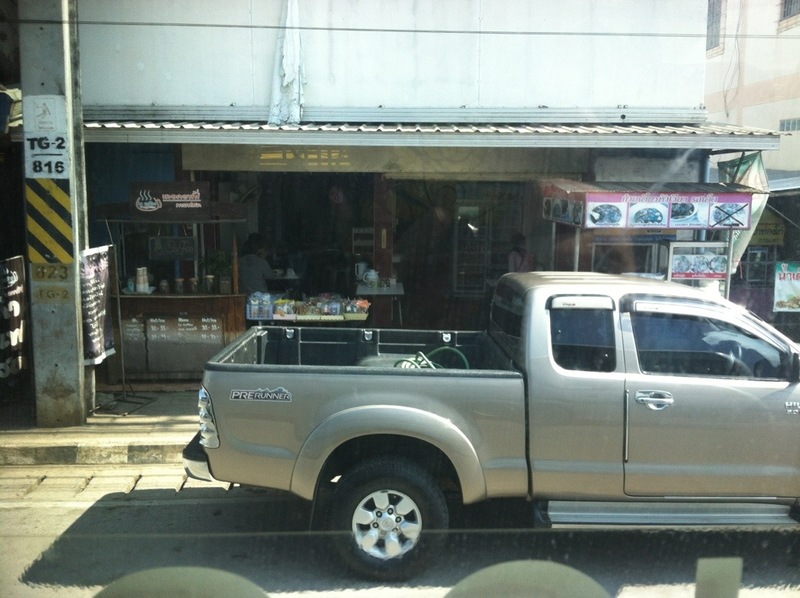 The bus to Chiang Rai took about 3 hours. 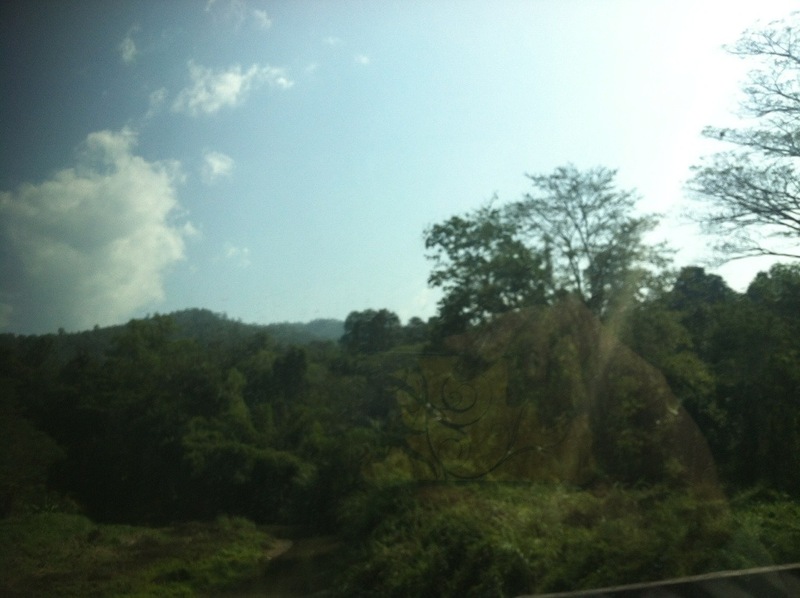 The road was twisty and scenic, but it was a struggle to stay awake and I nodded off for part of it. 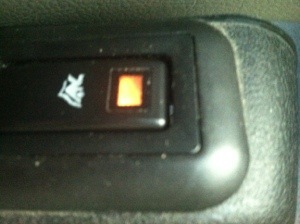 At one point, I decided to see what one button on the side of my seat did. The girl across the aisle had hers on, and she was all bundled up against the a/c so I thought maybe it was a seat warmer? I didn’t notice anything immediately, but a bit later I felt the guy behind me putting his feet or knees on my seat back. I leaned forward a bit, shuffled around a little, and then leaned back with a little force. That should send the message! Moments later, I realized that what I’d felt was actually a massage chair function in the seat, and had nothing to do with the passenger sitting behind me. I’m glad I hadn’t actually turned around and said anything! 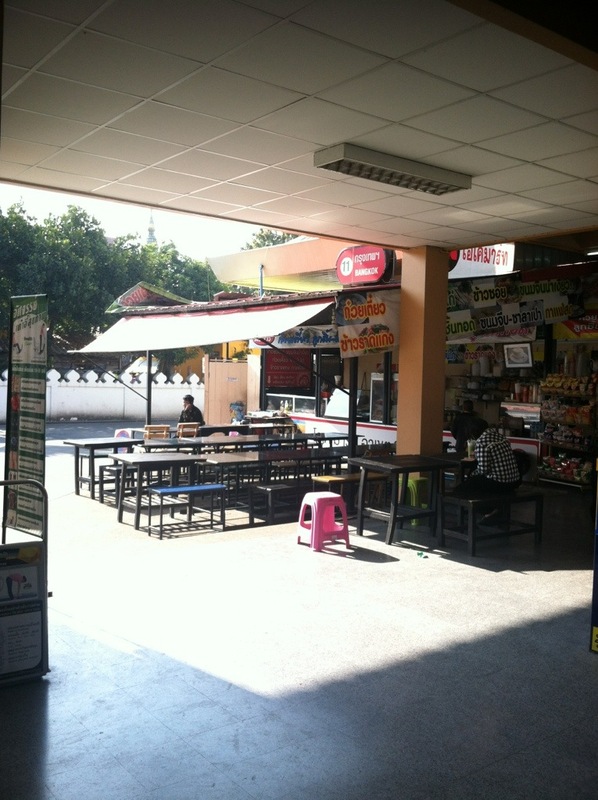 When I got to Chiang Rai, I got directions to my hotel (and a map) from the information desk at the bus station. 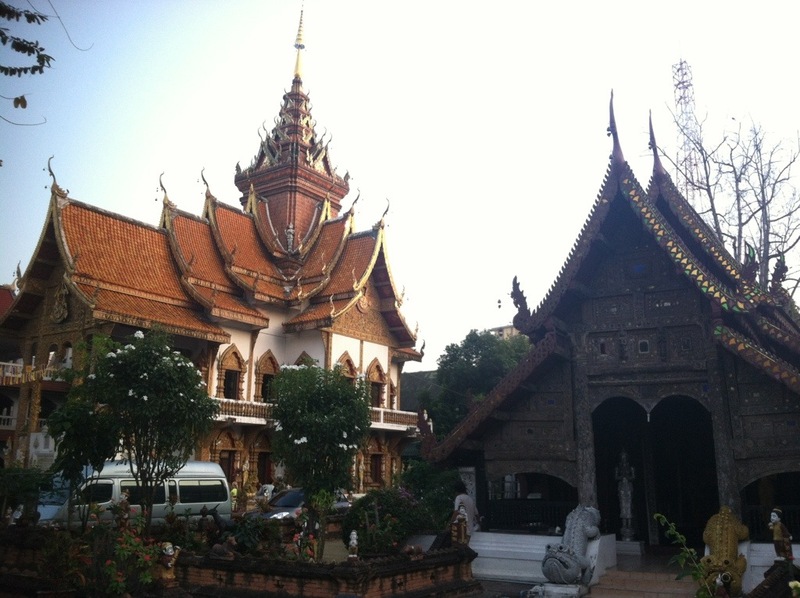 After checking into my hotel, I wandered around town a bit and got another thai massage. This one was maybe $7 but included use of the loose clothing to wear during the massage and had curtain dividers between the massage tables. 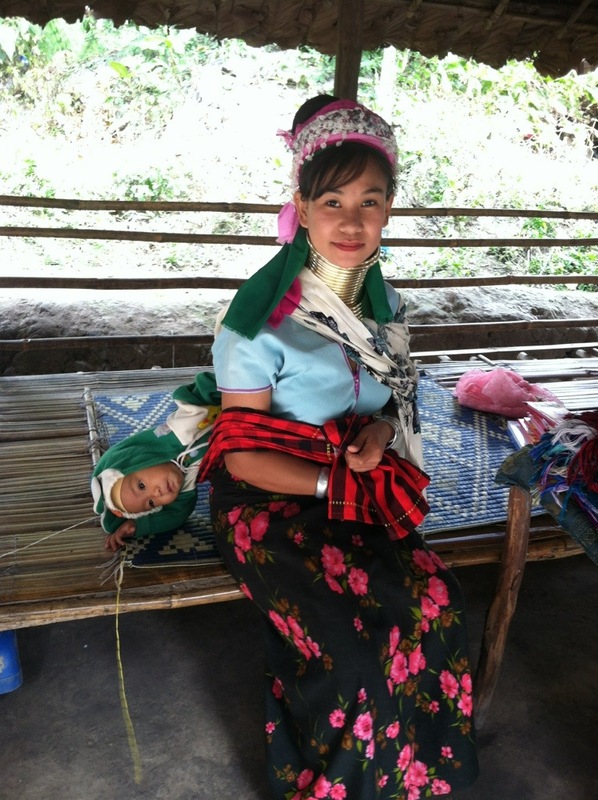 I met a friend of a friend of a friend for dinner and learned a bit about the small children’s home she’s helping with in Chiang Rai. 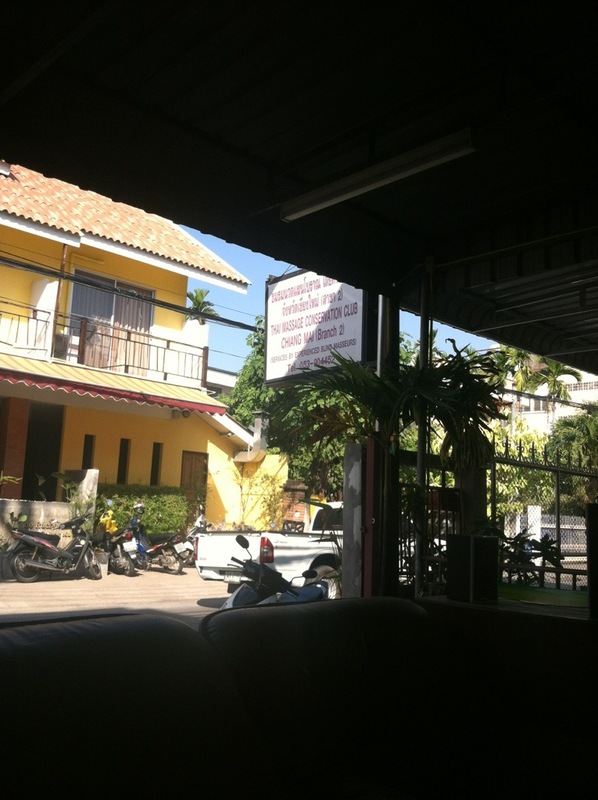 After dinner, I stopped back in at a tour agency I’d talked to earlier and booked a day trip for the next day. 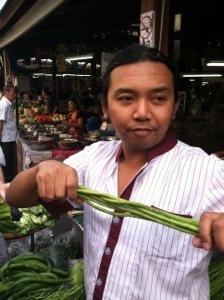 Then, we wandered around the night market and did a bit of shopping before saying our goodbyes. I wanted to balance out the previous day’s driving around with some good old foot time, so on Thursday morning, D and I walked to the bus station (1.3 miles as the crow flies, but quite a bit longer by road) and then he grabbed a songthaew back to the hotel to meet up with mom and I headed off on my own. Aside from poking my nose in various local shops, my first stop was for lunch at a roadside restaurant that our driver had said had the best khao soi in Chiang Mai. I must’ve looked like an idiot trying to figure out how/where to order (I just kept saying “khao soi” to everyone I saw until someone waved for me to sit down). It was indeed delicious, and maybe a bit spicier than the night before’s. My lips were burning but it was awesome. 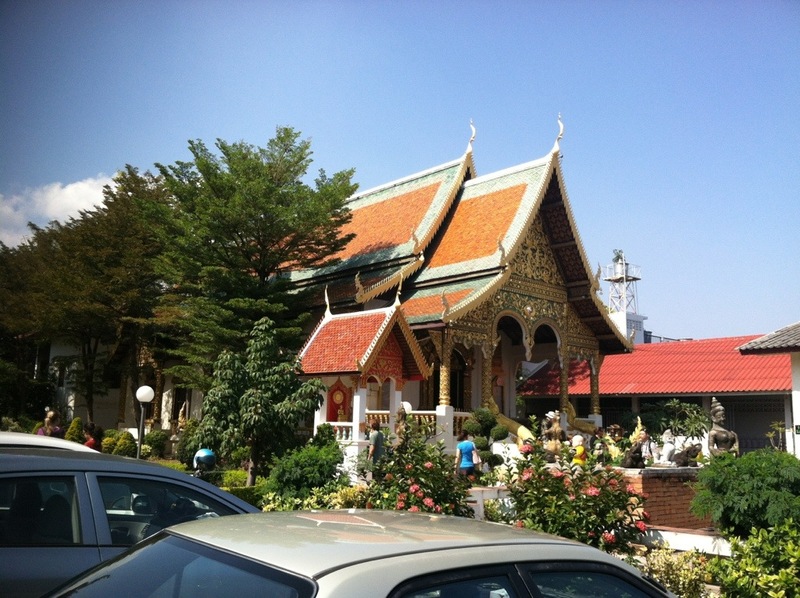 After lunch, I headed into the old city to check out a few of the temples there in town. 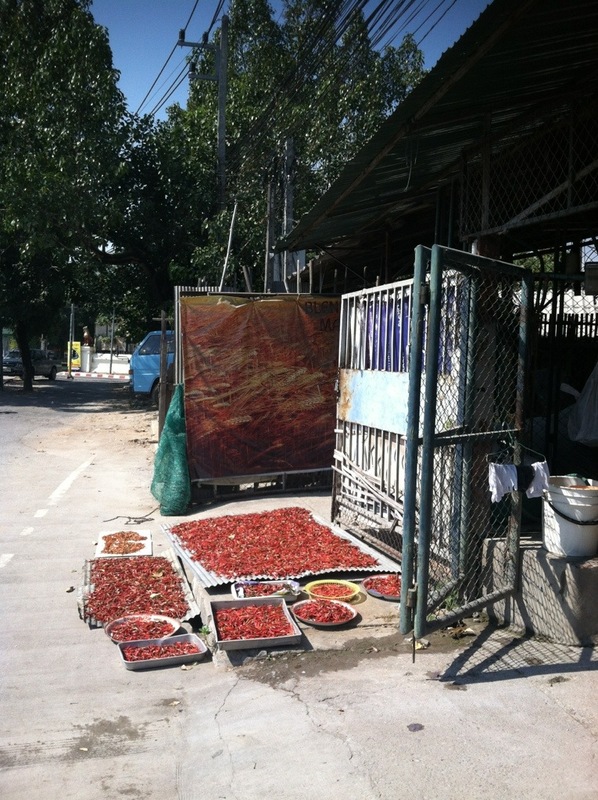 On the way, I passed some chiles drying in the sun. 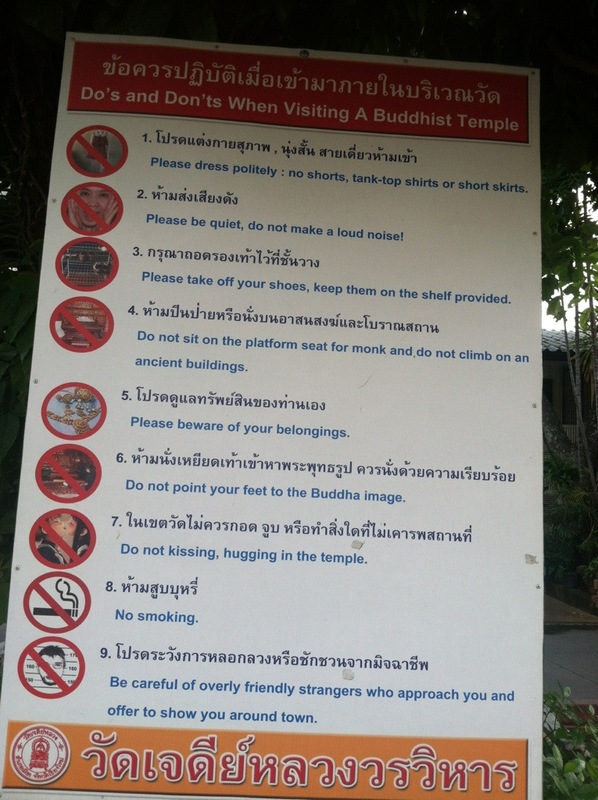 As I was on my way to the 3rd temple on my list, I saw a sign for thai massage by experienced blind masseuses. One of my ebooks had said blind massage was the best, and at just $6 for an hour, it seemed like it was worth a try! I wasn’t entirely sure what to expect, but it definitely was different from massages at home. A dimly lit room with a row of tables with pillows (not like the circle you put your face in at home). They had loose fitting pants for the girls who came in with skirts or short shorts, but I just kept my street clothes on. The massage was painful at times (they use a LOT of pressure here), but as the guy worked on my feet and legs, the 9 miles I’d walked so far that day fell off. Magic! 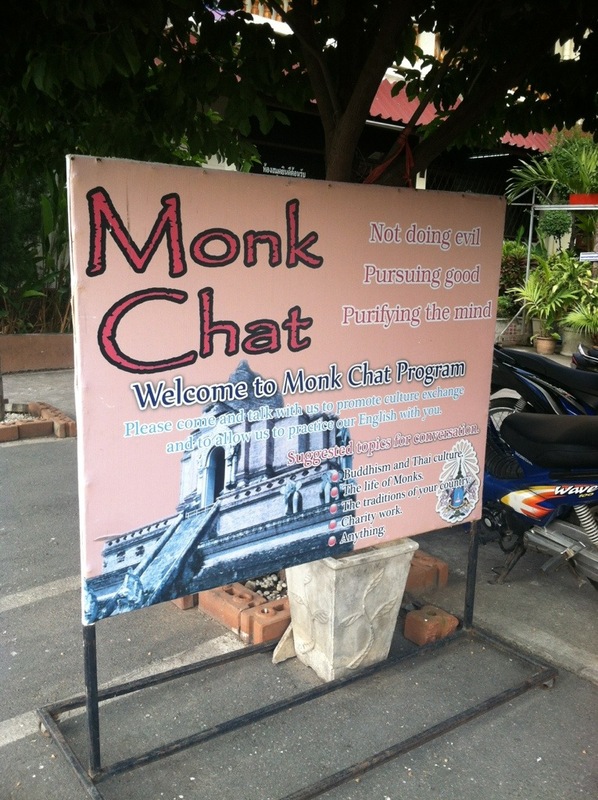 – All 3 of the young monks were studying at the local university and planned to take off their robes (stop being monks) and become “normal people” after graduation. 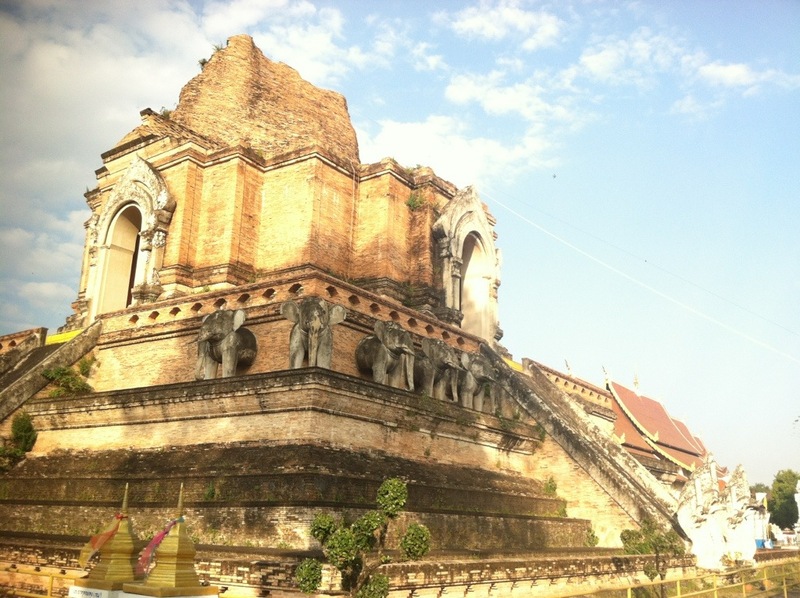 – 1 was from Laos, 1 from Cambodia, and one from southern Thailand. They have never seen snow. 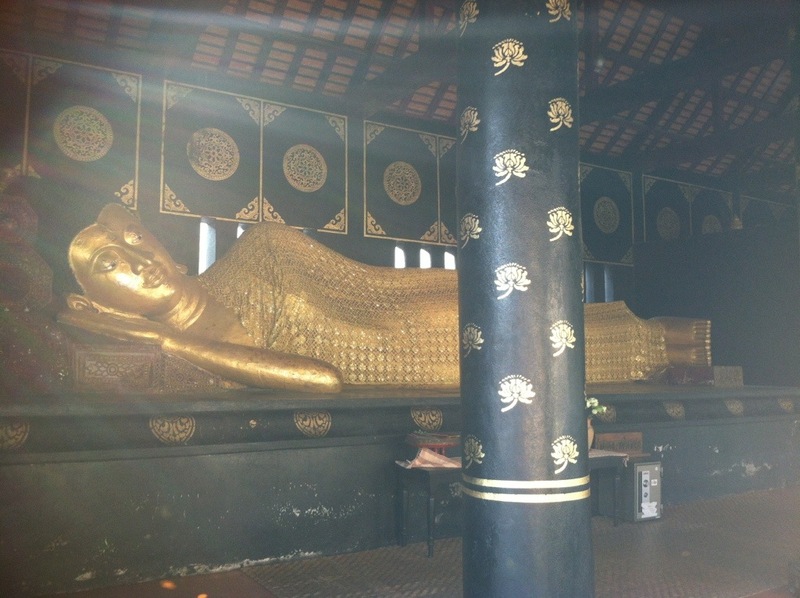 I think I need to read more about Buddhism before my next monk chat, so I can ask more informed questions! After the chat, I headed back to the hotel to meet up with M&D for dinner. We walked through a night bazaar but opted for a less chaotic local food option a few blocks away. I used the “map my ride” app to track my route for the day. It drained my phone battery pretty quickly but was nice to see that I’d walked around 13 miles! 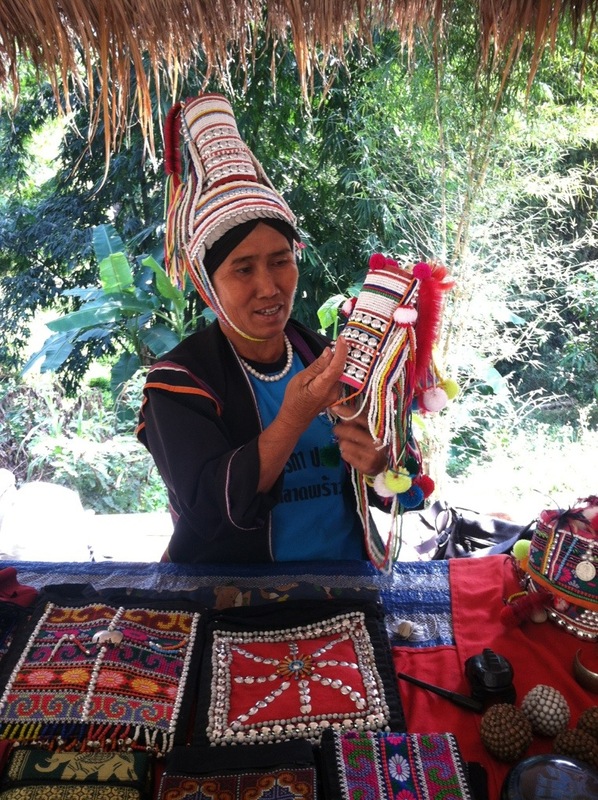 On Wednesday, the driver we had arranged through the hotel took us out to see some things out of town — a (recently established) “village” of 5 different hill tribes including Akha and long neck Karen. I put the word “village” in quotes because it was more like a few traditional style houses with tables for selling wares to tourists. Some of the things for sale were made there, but many things were the same trinkets available in other places. It was interesting to see the different appearances of the various tribes with their traditional costumes, but it’s hard to know if places like this are a “good” thing (for cultural preservation and an opportunity for outsiders to learn a bit about other cultures without having tour buses descend on actual villages) or if they’re simply exploitive. It felt a bit like visiting a zoo, but the women working (and presumably living) there seemed good natured about it all. 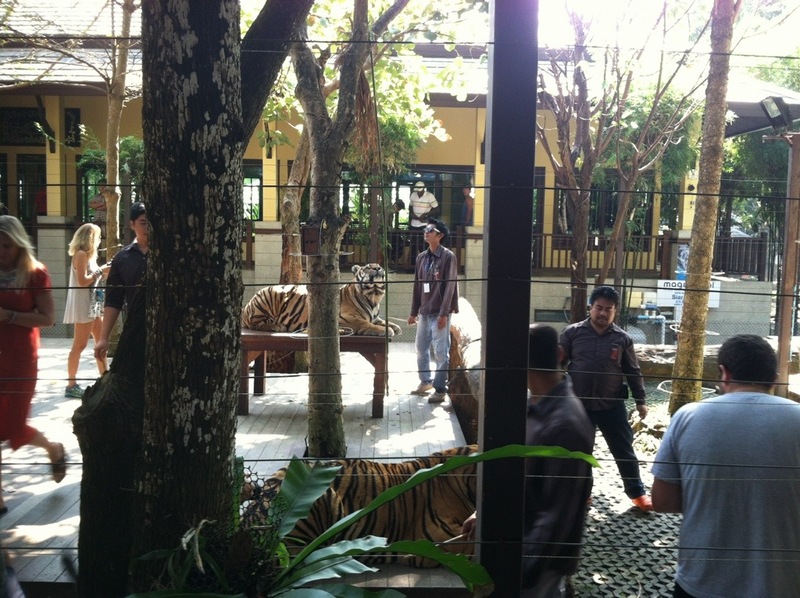 Next, our driver took us to a place that amounted to a tiger petting zoo. We ate lunch near the tigers and watched a stream of tourists come into the fenced in area, pose with the tigers (in some cases lying down against them) and then leave. If the tigers started to fall asleep with their heads at the wrong angle for a good photo op, the workers would tease them with what amounted to a large wand toy to get them to wake up. Part of me wanted to have a turn with the magnificent creatures and to to see what they felt like (and when else would I ever have the opportunity? ), but the cats really seemed annoyed (if a bit drowsily) and I didn’t really want to support the place any more than we had by eating there. 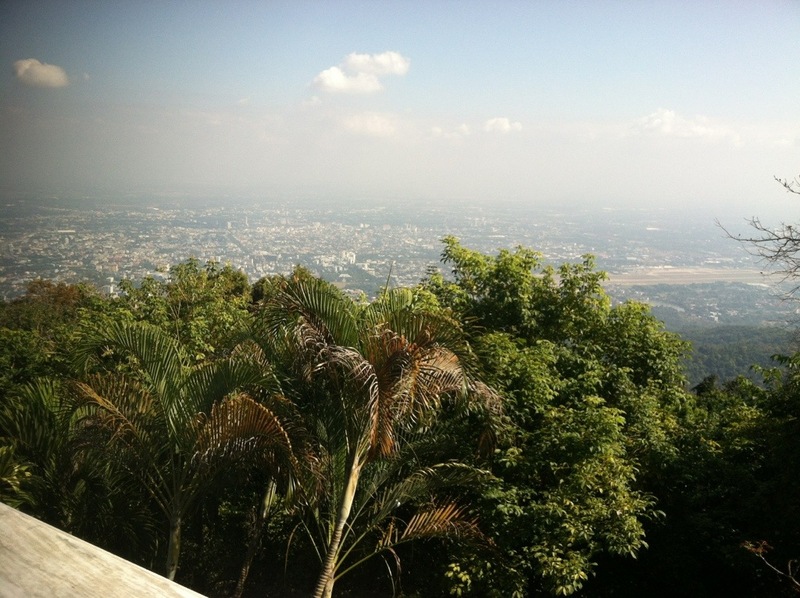 We found our driver and then headed to Doi Suthep — a temple on one of the mountains outside Chiang Mai. 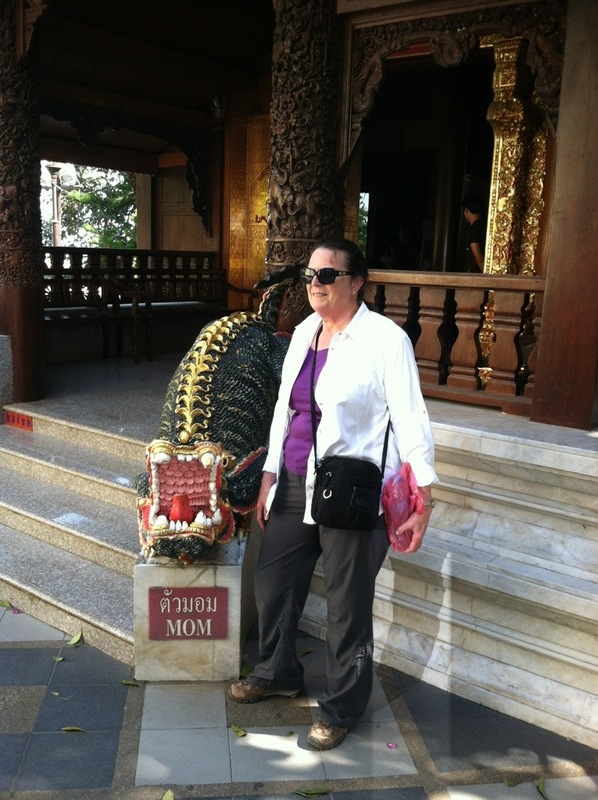 We climbed the ~300 steps accompanied by the long dragon handrails and then wandered around the shiny gold temple. 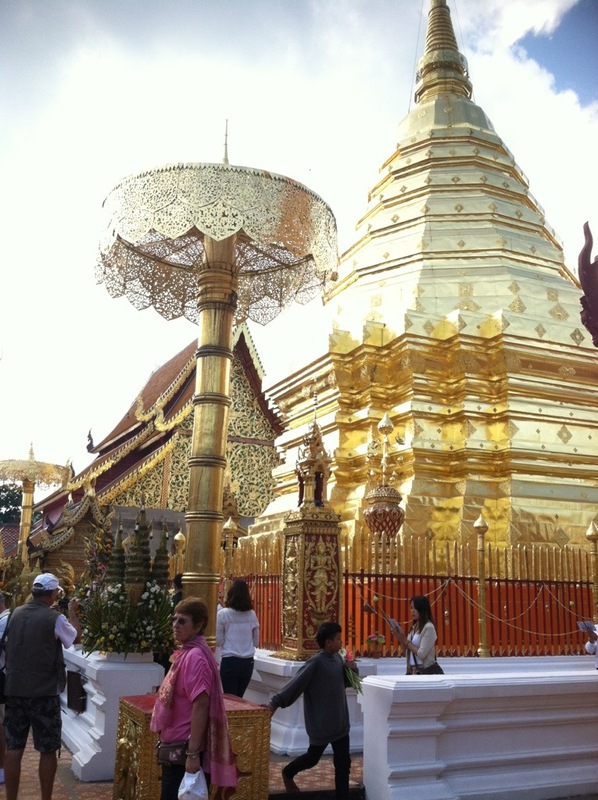 I was amused to see monks in their orange robes taking iPad photos of the temple, the view, and one another. 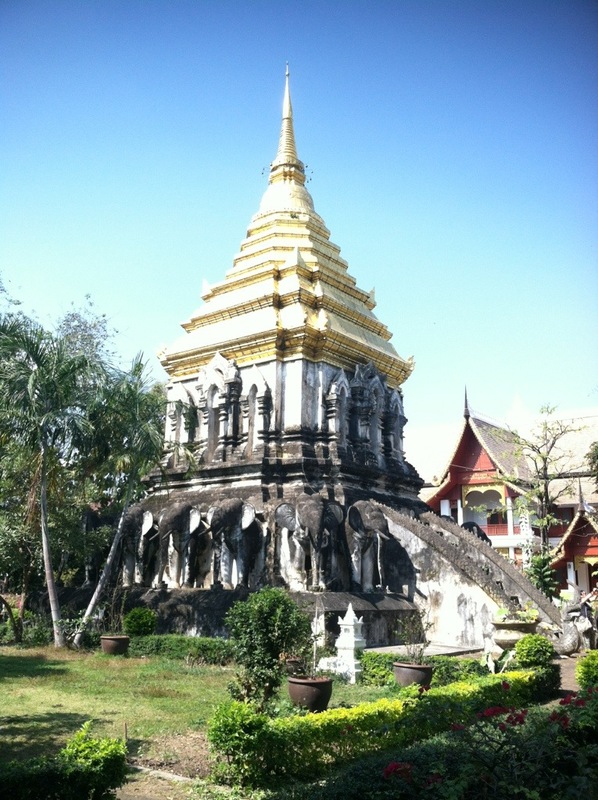 After visiting the temple, we weren’t really sure what else we should see, so when our driver suggested a boat trip up the river, that seemed like a good plan to us! The trip was fairly relaxing, and we chatted a bit with the nice Japanese couple who were also on the boat with us. We had a bit of excitement when the motor got tangled up in a fisherman’s line, so we stopped for a moment to free it. Our destination was a restaurant and garden with a bit of everything from basil to hogs. 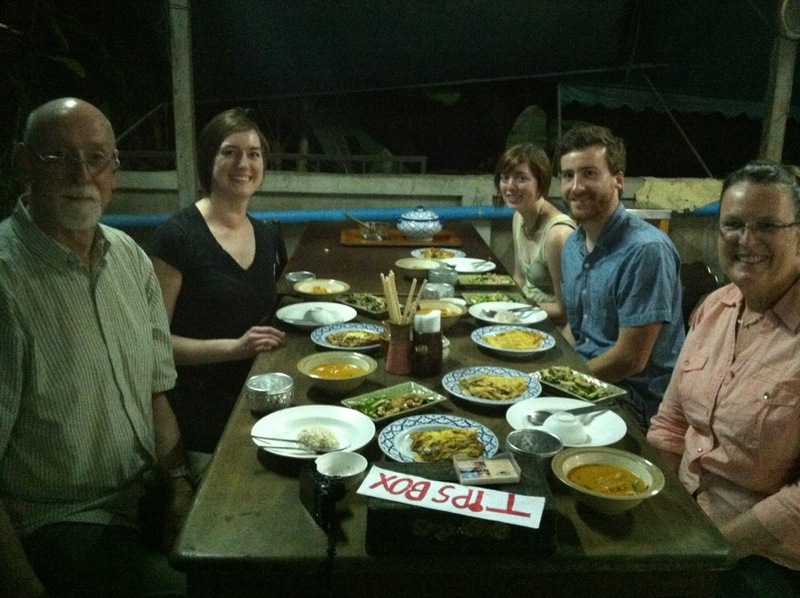 We enjoyed our juice (lemongrass for me) before heading back downstream. On the way back, the motor died several times, but we eventually made it back into town and got dropped off right at our hotel (which was on the river). 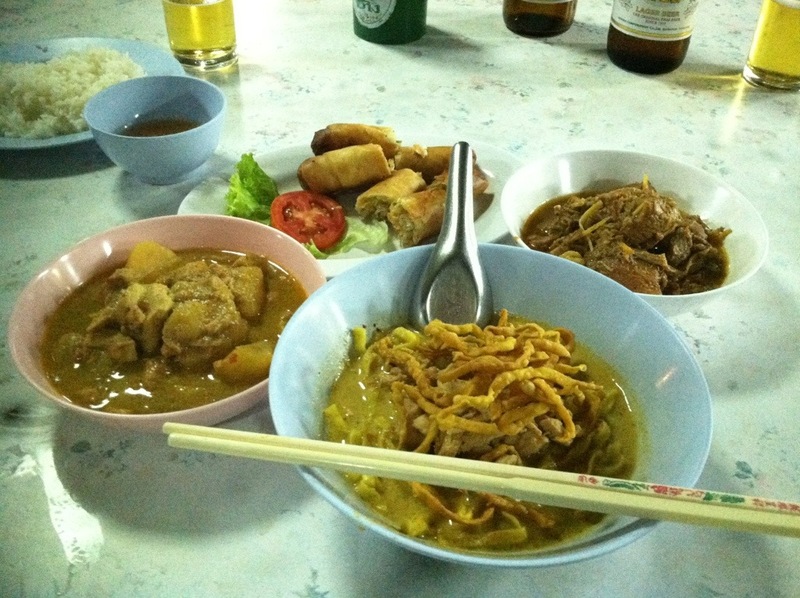 For dinner, we walked up to a restaurant that our driver had pointed out earlier in the day and enjoyed some local food –including my first khao soi (egg noodles in yellow curry) and some thai beer. 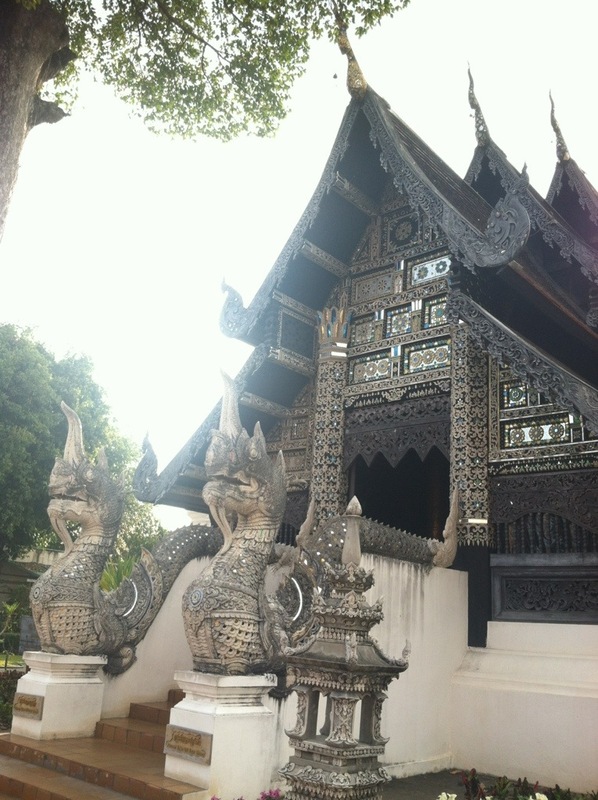 We got to our hotel/guest house in Chiang Mai before both rooms were ready, so we stashed our bags in my room and headed out to find some lunch. 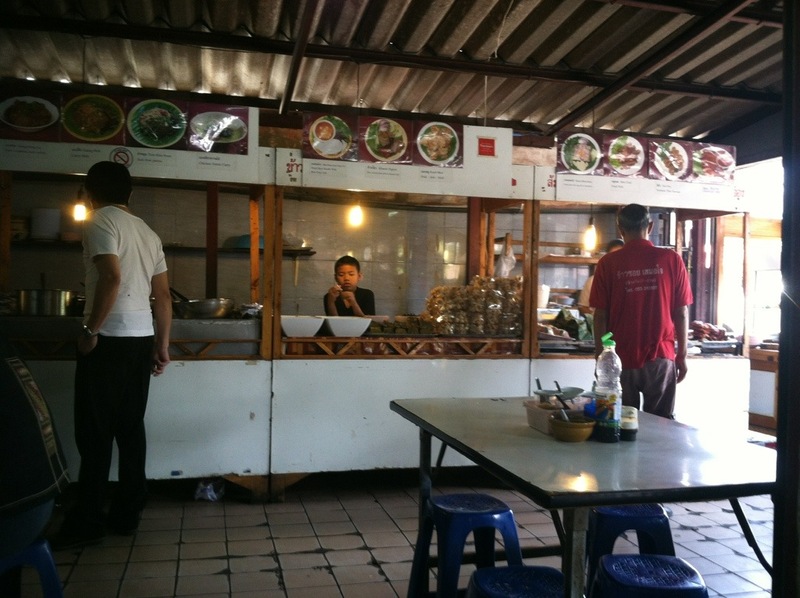 We didn’t have to go far before finding a street food cart making noodles. The woman didn’t seem to speak much English, but she had a helpful English menu so we each ordered something different to have a variety. After lunch, we headed back to the hotel for showers and a brief rest before getting picked up for our evening cooking class. 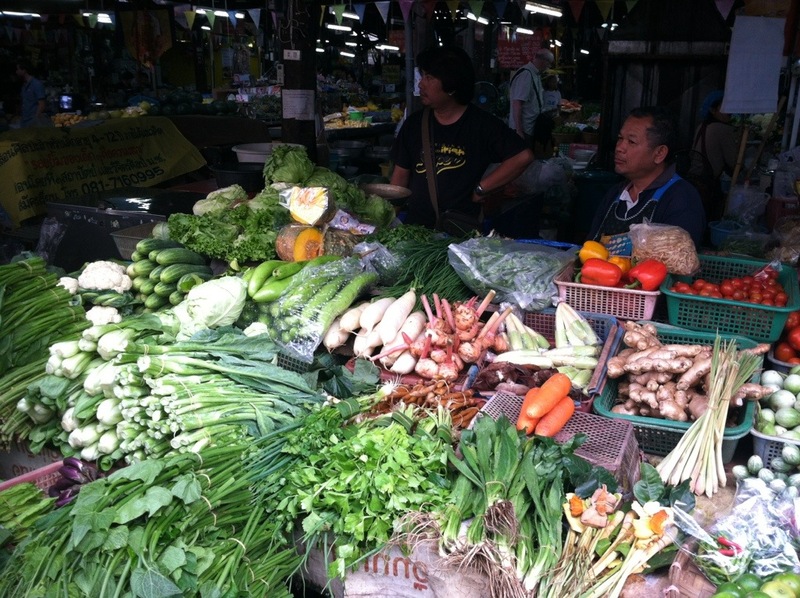 Ritchie, the teacher, first took us to the market and showed us many of the ingredients common in thai cooking, including a variety of peppers, ginger family roots, at least 3 kinds of basil, and several “eggplants” (none of which were purple). 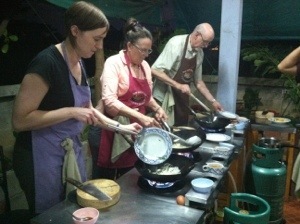 At the cooking school open air kitchen, we made tom yum soup, banana spring rolls, panang curry, pad thai (omelet style), and chicken with cashews. Turns out, we’re pretty good cooks! I hope the cookbooks we walked out with will help us be able to reproduce these recipes at home, because: yum! 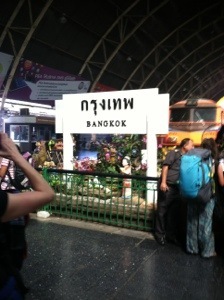 After a delayed departure out of Tokyo Narita (NRT) I landed in Bangkok (BKK) pretty late. By the time I got through customs, argued with a taxi driver whose meter was clearly in tourist mode (showing more than twice what the rate should have been before we even got close to the hotel), and detoured around a protest road block (a couple of beat up black cars and several men in matching black t-shirts with white writing), it was 3am when I got to the hotel. 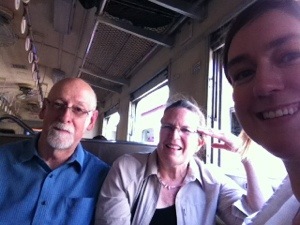 In the morning, I met mom and dad for breakfast and we decided to get out of town sooner rather than later. Dad and a guy at the hotel talked with a taxi driver about the best way to avoid the roadblocks on the way to the train station and we were off. There was very little traffic on the roads, and even the sidewalks seemed empty to me. 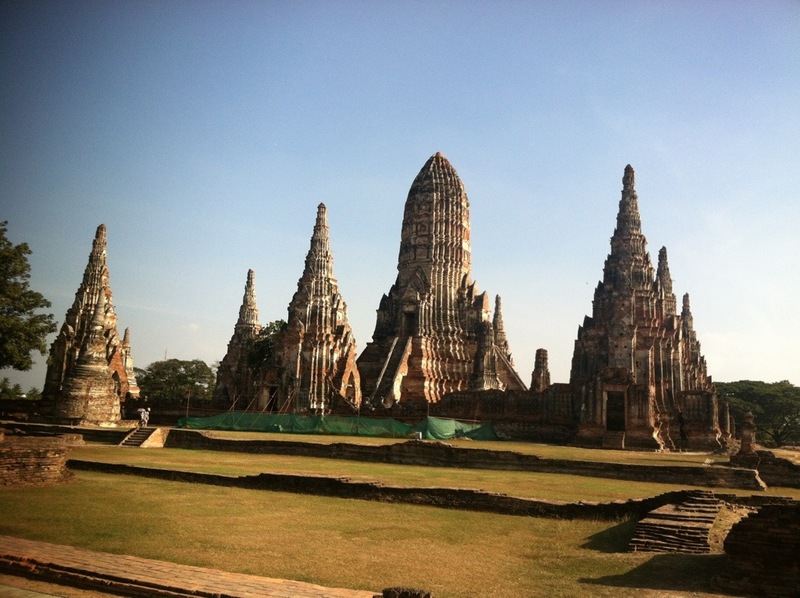 M&D had bought the overnight train tickets to Chiang Mai starting from the next city up, Ayutthaya, so we bought cheap tickets on the local (slow) train to Ayutthaya. 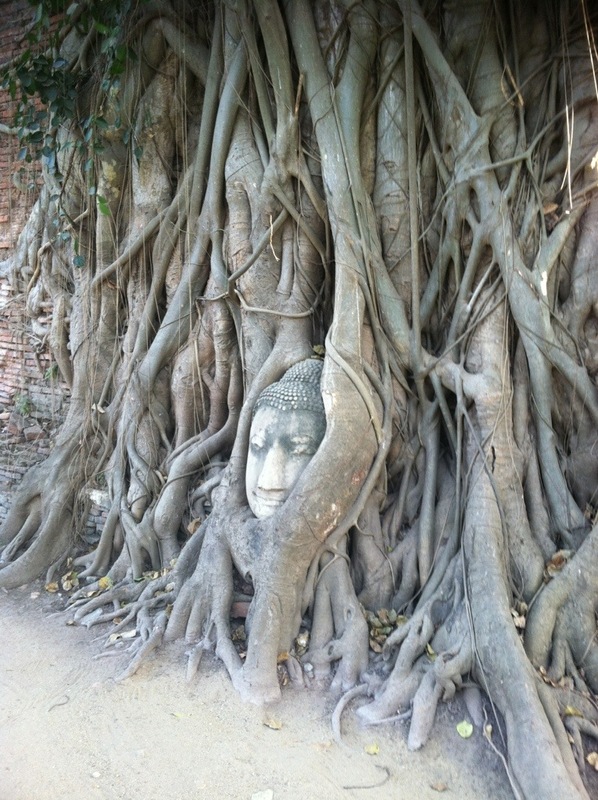 In Ayutthaya, we left our bags at the train station, brushed off the pushy driver/guides, and walked across the way to get lunch. The waitress there suggested that we could take a 4-baht ferry across the river and hire a tuk-tuk for the afternoon for about 1/4 of the price of the pushy people by the train, so that’s what we did. 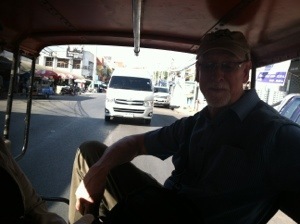 The tuk-tuk driver didn’t speak much English but we showed him on the map which sites we wanted to see and got a bit of a city tour in the process. The ruins were interesting, and the red bricks looked particularly colorful in the golden light as the sun started to go down in the early evening. 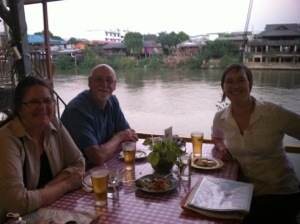 After our tour, we found a little restaurant along the river and had some papaya salad and beer before catching the cheap ferry back across the river to wait for our train. The train was cozy. 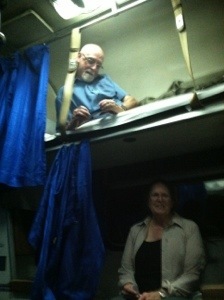 Bunks along both sides with a narrow aisle filled with bags to negotiate our way through. 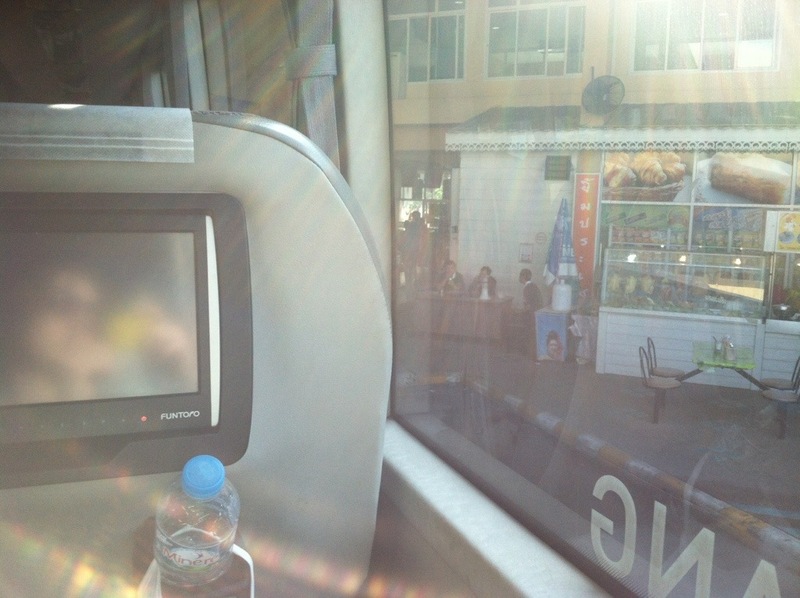 Our bunks were at the front end of the car (we had boarded at the back), and near the toilets. 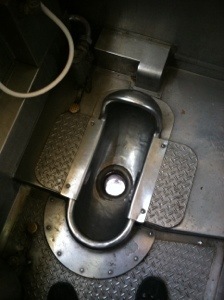 In the morning, when it got light out, we could see that the toilets had no plumbing at all and were really just holes in the train floor, straight through to the tracks below. 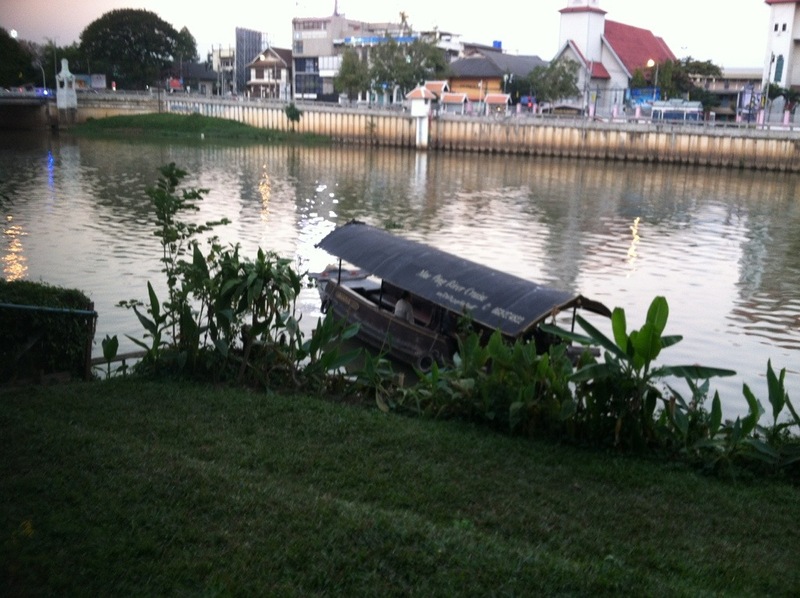 Note to self: do not walk along railroad tracks in Thailand. The bunks were fairly comfortable, but sleeping on the train was a challenge as it was not a particularly smooth ride and was occasionally quite noisy and jarring. I woke up every 1-2 hours. At least being on the bottom bunk I had a window to peek out of. 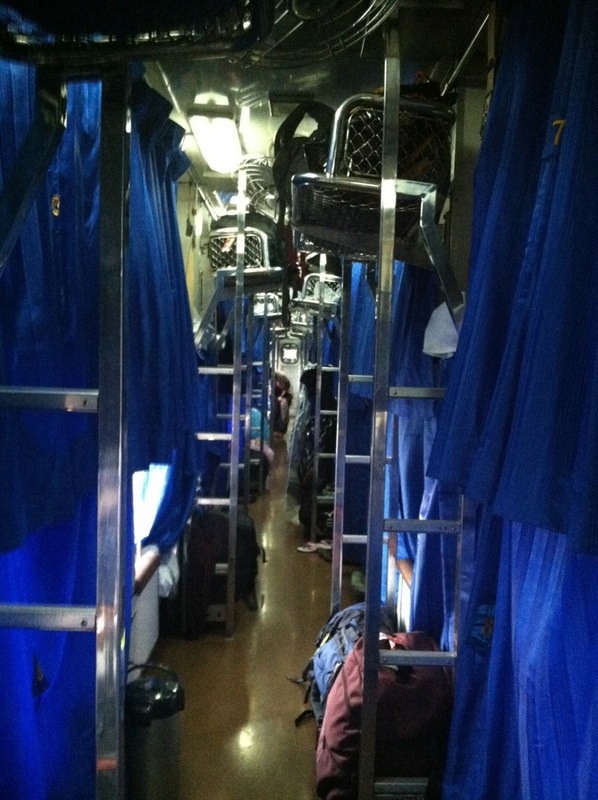 Shortly before arriving in Chiang Mai, a train employee came through the cabin saying “get up!” and converted all the bunks into seats, stowing the top bunks back into the ceiling. 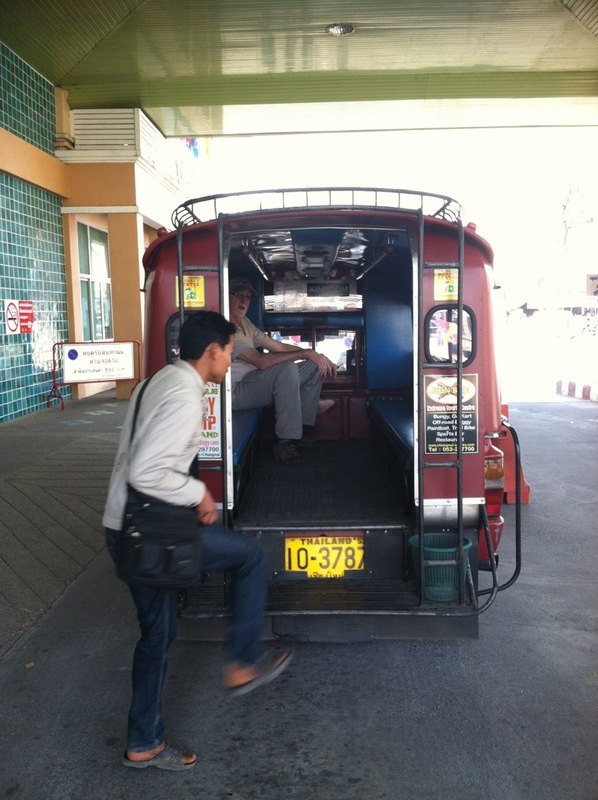 At the end of the line, we collected our bags and D haggled with some songthaew drivers to get us a cheap ride to our hotel.